When it was announced that Emerald Green was the Pantone color of the year, I said yuck, what can we possibly do with this color in the store? Sometimes I like having the new and interesting colors introduced every year because it helps us expand and stretch our knowledge and use of color, and take it to heights we never could have dreamed of before. I think this is so with Emerald. 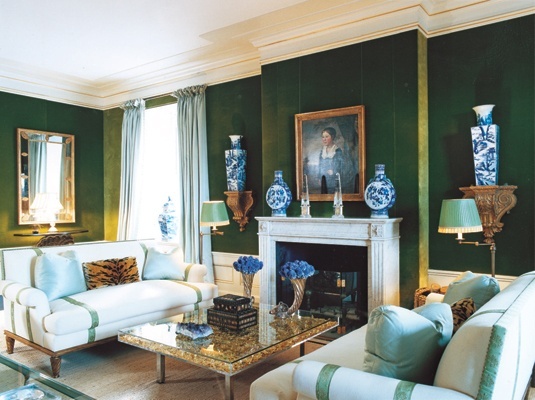 Since then, there has been much inspiration showcasing wonderful uses of this color in every room in the house. 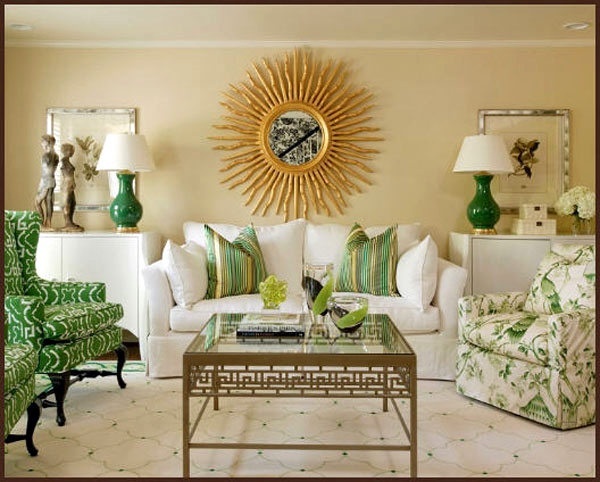 Sometimes boldly, and sometimes subtly, the examples below are some of the best combinations I could find, to inspire you to add a little green into your life! Greek Key embroidery by Hamburg House. 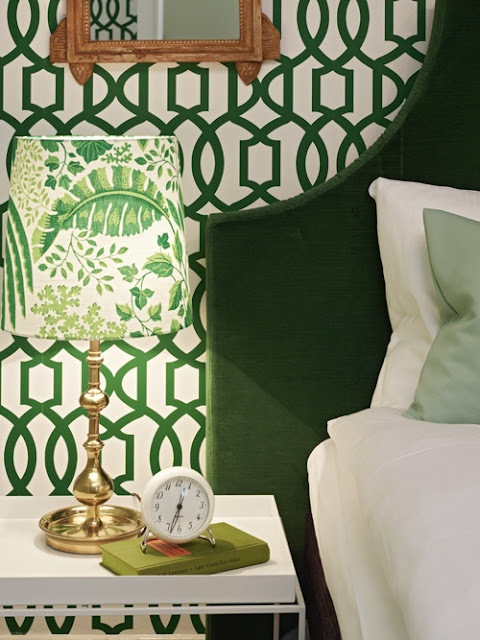 This green theme evokes modern elements with the lattice wallpaper and green velvet headboard. I love the accent pillow in aqua just to throw off that too much of a green thing going on, and the lampshade that adds a garden element to the room. 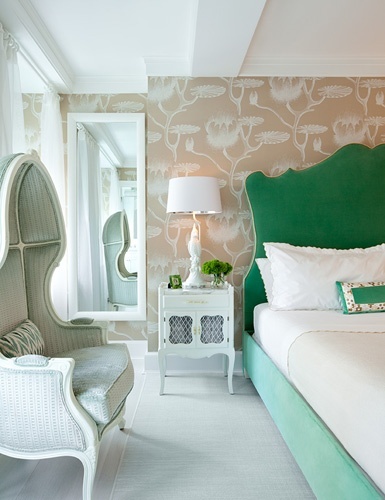 The neutral surroundings in the bedroom make the fantastic aqua green velvet bed even more of a conversation piece. I love white linens, and this is a great example of using them. Tucking in the sheets and coverlet for a more casual feel, just the pillows you sleep with, and one small accent pillow are perfect for keeping it simple. I love to make my bed this way in the summer, and it is also a nice way to make up the bed when you have such pretty side rails. Just would not be the same if the rails were covered up with the linens. I can never resist a canopy. Keep in mind, to make this bold color work, you must have high ceilings and a nice sized space. Can you imagine the wonderful glow in this room in the evening! 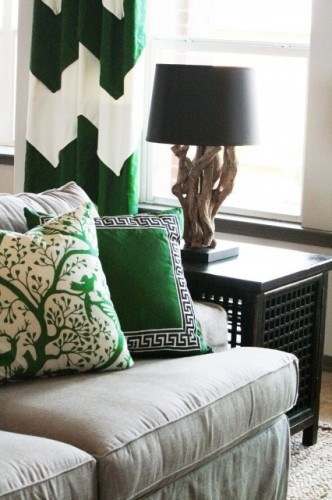 Personally, if I were choosing a green theme, I would do it with accent pillows. Then I could do something different later without having invested too much in order to follow the trend. My dream desk! What can I say but WOW! 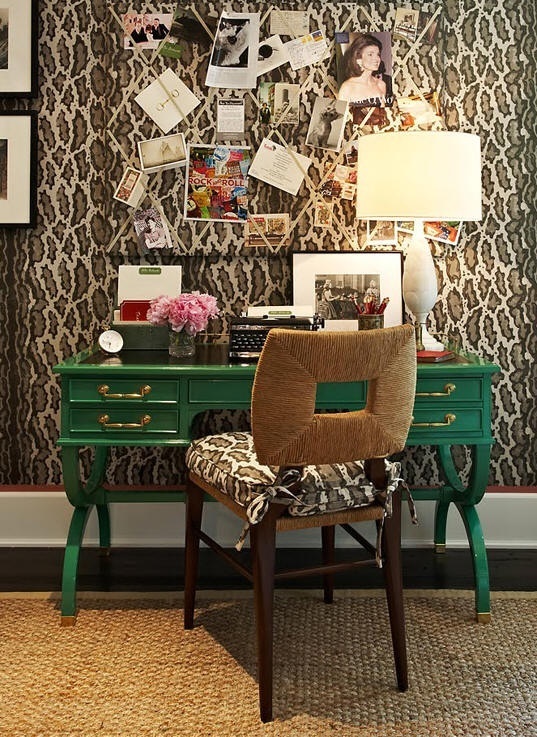 I love the leopard wallpaper, the white accents to keep it fresh, the seagrass flooring, and oh so fabulous green painted desk. 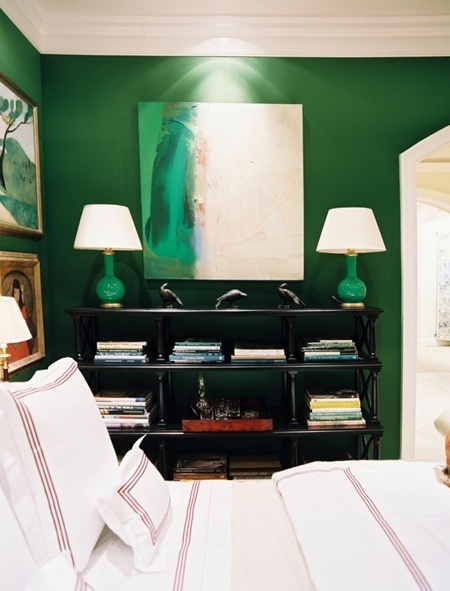 Another example of mixing the pale aqua with the bold emerald green and white accents. This is just lovely. I adore the detail of the tape on the sofa pillows, and the addition of the leopard pillow is fabulous! 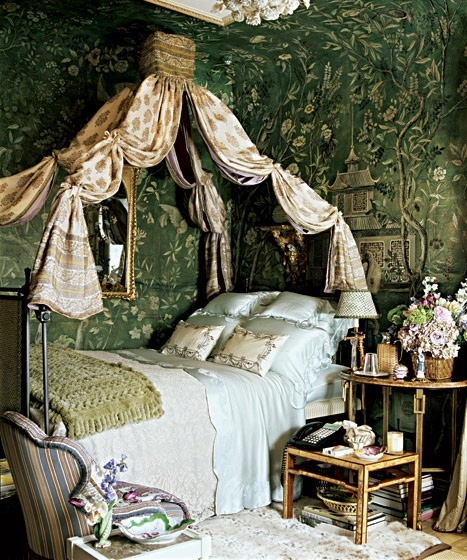 Here we go again, white bedding with my favorite, a touch of embroidery to pick up the green in the wallpaper. A modern approach using green walls and black accents on the bookcase and embroidered sheets. A stylish man could be very comfortable in this room. 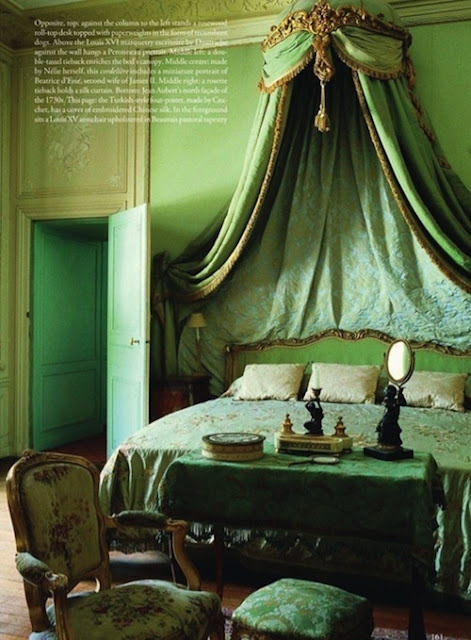 Since I live in Paris, I could not resist showing you this gorgeous bed! Marie Antoinette, oui? 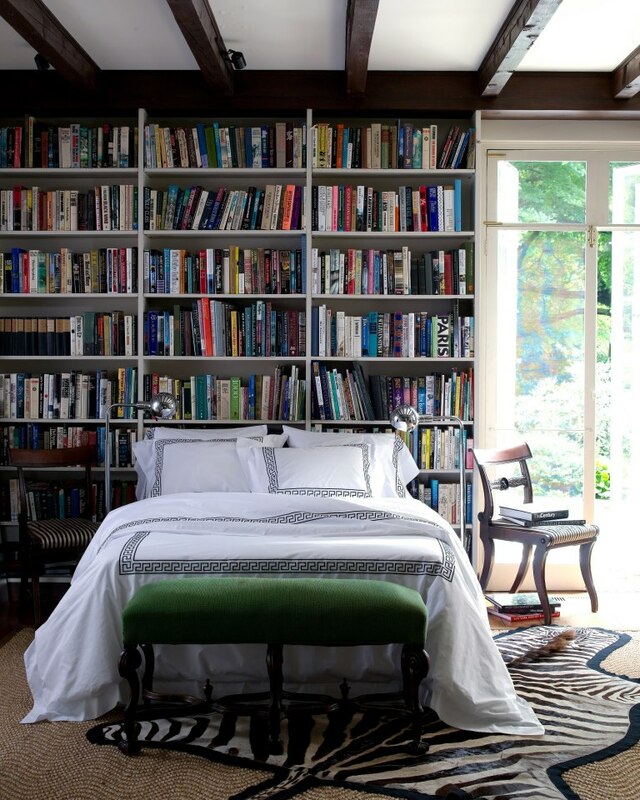 This bed is crisp green and white at it's best. I would love seeing this at the beach, or house in a hot southern climate. Green glass is such a lovely accent on a table. You can pick up pieces like this at most flea markets for so little. 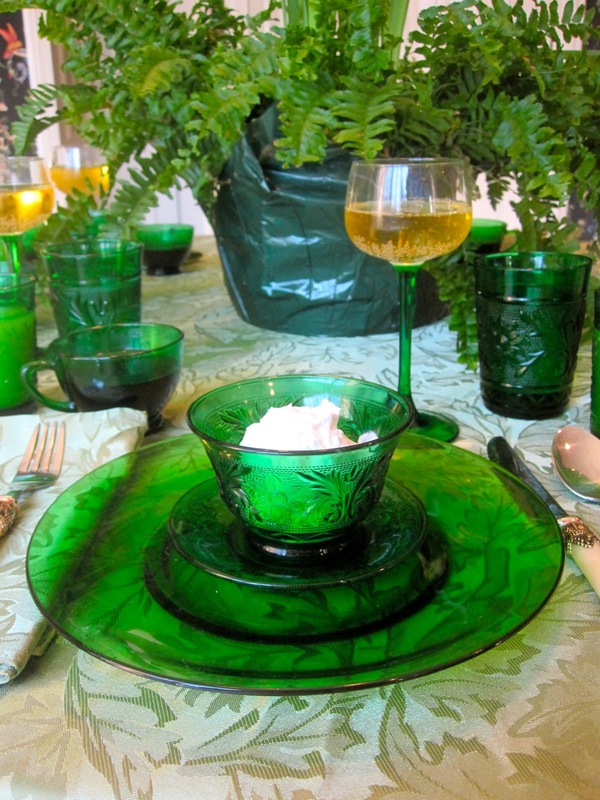 So, if you are inspired by this green color, this could be a great way to incorporate it into your entertaining style. I have some green short stemmed glasses from my grandmother that I can remember her serving ice cream in. I cherish them, and think of her every time they are a part of my table. 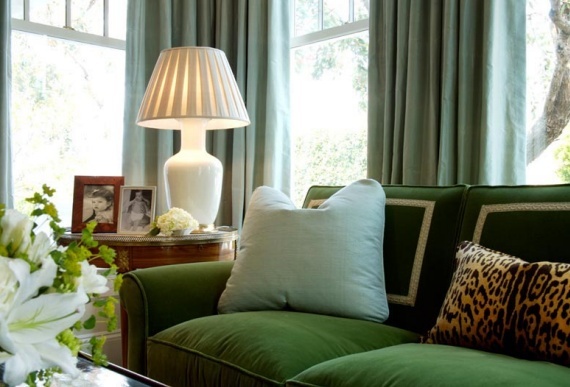 I love the dark green walls with the pale green silk window hangings, white facing sofa's with tape trim detailing, and the light green pillows. The blue and white porcelain is also an interesting addition that just makes this room so wonderful!